Mulch on a vegetable garden is absolutely critical to the success of the harvest. Mulch is not an option on the vegetable garden. It is critical because it is food for the soil food web. 4. Mulch creates a habitat for the key beneficial insects in a garden including ants, spiders, and ground beetles. They will contol over 50% of the pest insects entering the garden. See discussion. What Material Can I Use For Mulch? 1. If you have trees then you have leaves. Chopped leaves makes an excellent mulch and they are free. The leaves need to be chopped by either a mulching mower or a leaf shredder to give the habitat that is needed and be bite sized for earthworms. 2. If you have no leaves, then straw is the best material. It is relatively inexpensive and last most of the season. In both cases you will likely refresh the mulch in the spring at the beginning of the season and then in the fall. You need to have 3 to 4 inches of organic mulch on the veggie patch 365 days a year. When it gets down to 2 inches, it needs to be amended. What Is The Soil Food Web and Why Do I Care? A healthy soil with over 5% organic matter will have billions and billions of visible and microscopic creatures in a completely integrated community. Just one tablespoon of healthy soil will contain over a billion microbes. The visible members in the soil are earthworms, millipedes, centipedes, sowbugs, earwigs, springtails and many more. The little microscopic guys include billions of beneficial bacteria, fungi, protozoa and again many others. 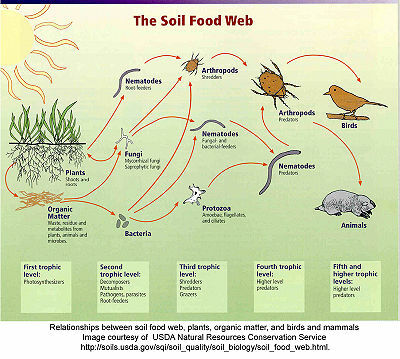 The creatures in the soil food web will turn organic matter in the soil into liquid nutrients that are in a form acceptable as food by all plants in that soil. In a soil with 5% organic matter you really don’t have to add any fertilizer; ever. The organic mulch is lunch. It is the essential food to keep the soil food web population high and healthy. No mulch, the soil food web diminishes to a level where it is no help to the plants and you have to fertilize often. So it is a no-brainer for us. Organic mulch leads to success in the harvest. It does not make any sense not to have that mulch over the entire garden 365 days a year. Here is a drawing showing the soil food web.